The cat walked through the world, with its whiskers, ears and paws . . . and the child saw A CAT, and the dog saw A CAT, and the fox saw A CAT. Yes, they all saw the cat.' 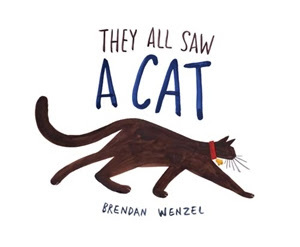 In simple, rhythmic prose and ingeniously stylized pictures, Brendan Wenzel takes young readers on a walk alongside a cat. But is it really a story about the cat, or is it about the creatures who see it? This is a glorious celebration of observation, curiosity, and imagination from a bright new talent on the picture book scene, Brendan Wenzel, who promises to be the next Jon Klassen and heir apparent to Eric Carle. With minimal but carefully chosen text, Wenzel invites kids on a walk with a cat to encounter different creatures and environments. As each animal sees the cat, we get to see what they see. Wenzel uses considerable skill to show us an image influenced by the animals’ physical eyes, and also what they feel about the cat. My favourite page has to be when the terrified mouse looks up at the hideous, snarling cat monster! Teachers and parents are conscious of the need to help kids see life through different points of view. They All Saw a Cat is a great start to this, as children look through the eyes of goldfish, foxes, snakes etc to perceive the cat according to their visual and emotional abilities. The picture book also makes an excellent choice for schools wanting to help kids learn about visual literacy, with each perspective being clearly delineated. Book Chook Feather of Approval for this brilliant book, and many thanks to my wonderful local librarian for sharing it with me! The cover (above) really doesn't do the book justice. Check out the book trailer below for more of an idea of the fabulous illustrations. It's always a shame when the cover doesn't do the book justice. There is probably no bigger target audience for shopping via a wonderful cover. This does sound like a great read though, and your review comes at just the right time, as we are gathering our reading list for 'cat week'. Thanks for adding the trailer btw.